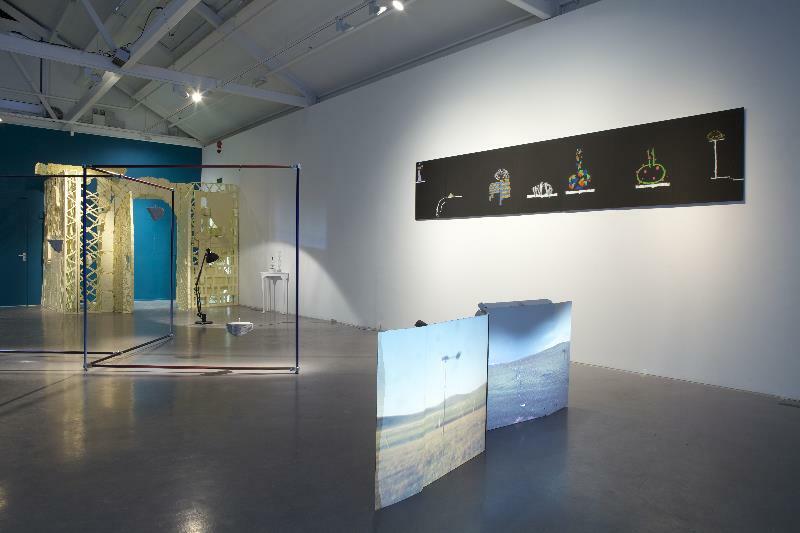 The Glass Cat – the strange animal from which the present exhibition takes its title – is a creature cognizant of everything in a world in which nothing is certain. The Cat is the absent centre of a landscape laced with unease, a place in which all things are shadowed – the cat’s transparency notwithstanding – by doubt and contradiction. It is a potentially poisoned continent wherein, to borrow a phrase from Marcel Duchamp, a “Playful Physics” reigns. 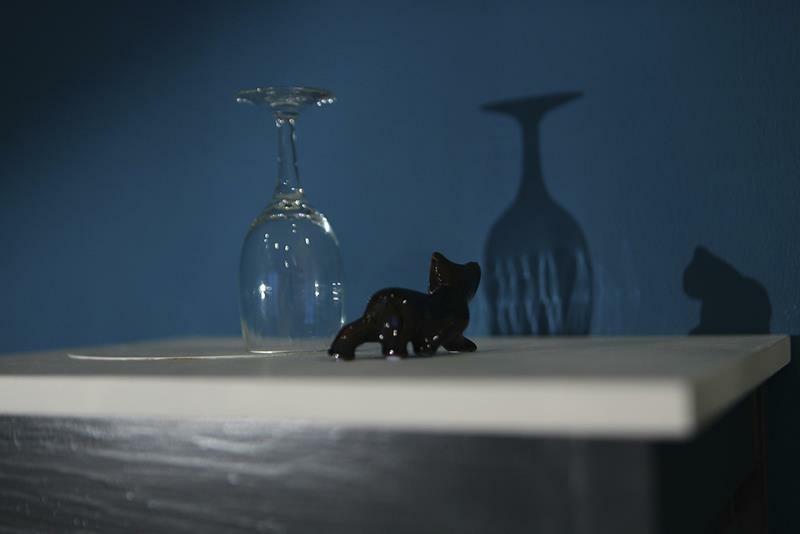 The Glass Cat, as comprehending and mysterious as those in Huysmans, Baudelaire or Poe, haunts this looking-glass landscape, aware of all there is to know yet revealing or explaining nothing at all. The ostensibly stabilising couplet of Power and Control, of knowledge in the face of the uncertain and the uncanny, has faded out like Lewis Carroll’s Cheshire Cat. And yet everything in this exhibition – the careful colouration of the walls, the tightly calibrated juxtaposition of individual works, and even one’s means of entrance and exit – propose, consciously and implicitly, the light but intelligently controlling touch of the creative curator’s hand. 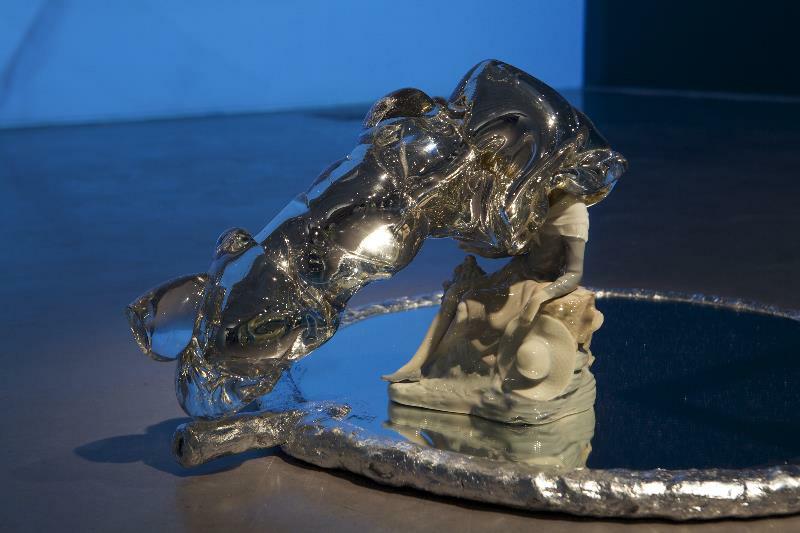 Such a shift from the thing itself to its coded or translated apparition can also be seen in Helen Maurer’s Glass Fountain II. 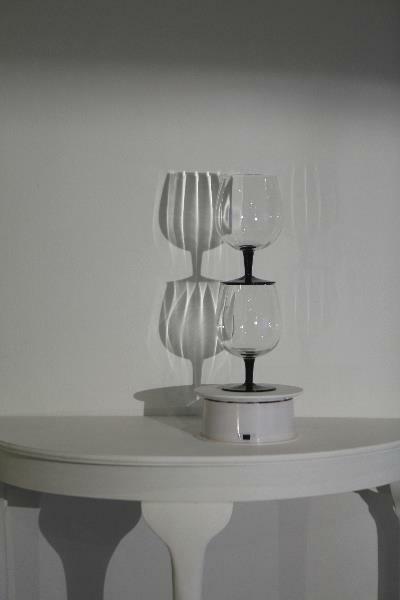 Upon a moving turntable two drinking glasses slowly rotate, their sharp but shimmering shadow being thrown upon the wall via a powerful spotlight placed close to the stacked glasses. The solid glass becomes, in this rendition something akin to smoke, drifting clouds or indeed a fizzing fountain, the mechanism of the illusion being visible for all to see. 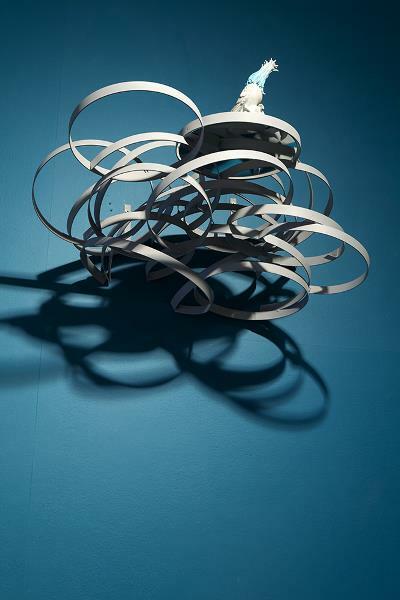 The spin of the shadow is mildly hypnotic, as though designed as a trap for the too inquisitive spectator, though the fact that most of the work’s components are placed on a small hall or bedroom table reminds us that the illusion is actually disarmingly simple, arguably all the more powerful for its aspect of self-revelation. 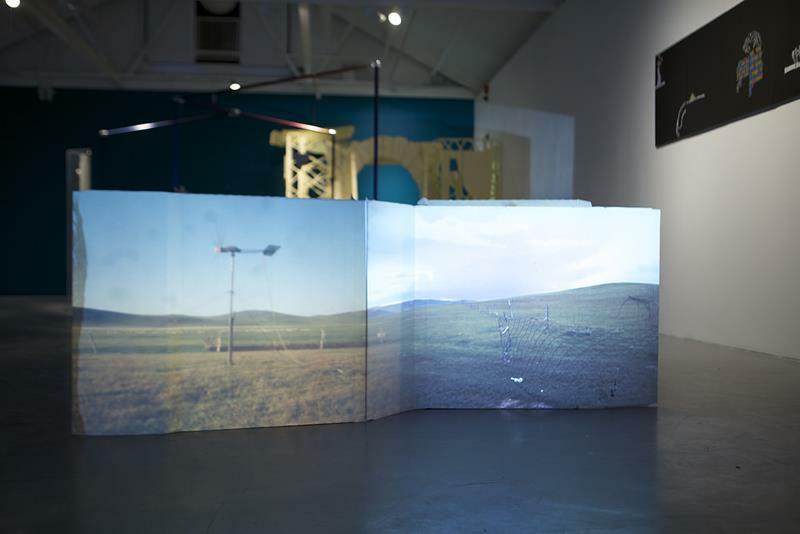 Sophie Lascelles’ In the Grasslands might be regarded as structurally akin to Maurer’s Glass Fountain II, insofar as each piece is comprised of units arranged so that some of them, when combined, generate another part of the work. Maurer’s glasses and spotlight produce shadows, whilst the large projector used by Lascelle gives us an image of a windmill located on a barren Mongolian plain. The image, deliberately thrown out onto a makeshift cardboard screen, reveals how nomadic people harness natural elements to recharge portable electronic equipment, suggesting a culture that is at one and the same time ancient and modern. 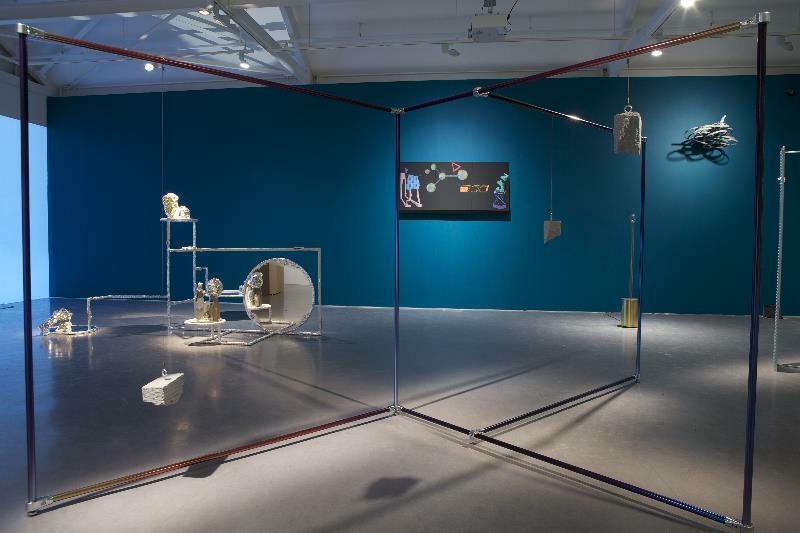 Lascelle’s assemblage may itself be read as a paradoxical object, particularly as one imagines the windmill – a mere filmic representation – somehow feeding energy to the objects in the gallery, and especially to the projector upon which its own image depends. Shadows and projections generally militate towards the implication of the existence of other worlds positioned outside the normal scope and conventions of human perception. With his playfully seductive Bubble, William Waterhouse appears to be constructing his own concisely enclosed world, in a creative act that uses as its engine a neat systematic process. 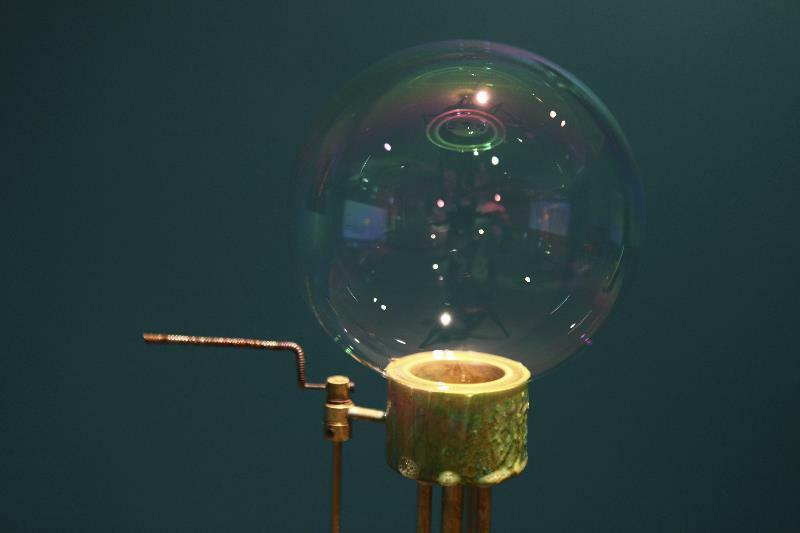 At the top of a tall metal stem a fist-sized bubble materialises and slowly mutates before being drawn back into the machine, its constituent chemicals being recycled so as to make a subsequent bubble, then another, in a potentially infinite production line of “natural” forms. The sphere’s iridescent surface acts (as do other artworks in Glass Cat) as a lens or filter through which to view the surrounding space, its spherical form connoting the wholeness of an entire planet waiting to be explored. 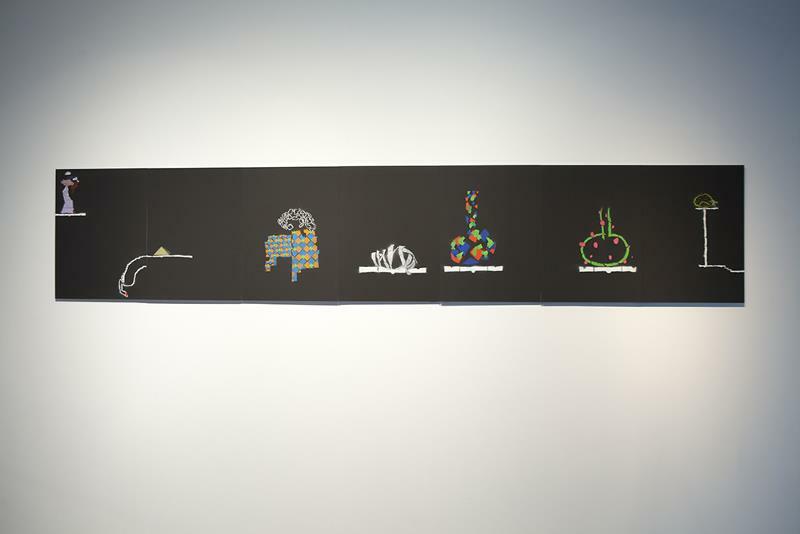 The work points both to fragility and to resurgence or recuperation, a plural thematics which might, once again, be extended to the whole of the exhibition. 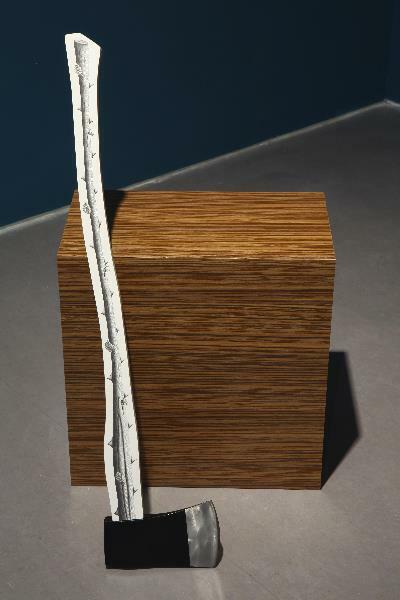 In James Ireland’s Scenic View (Mountains) one is requested to read three small bodies of breeze-block dangling from a series of interpenetrating poles as the mountains of the work’s title. The dreary grey of this dull artificial material stands in stark contrast to the beautiful colour of the poles, their tones continuously shimmering so as to embed these “mountains” within a lively landscape luminescence. The target “scene”, normally the focus on one’s attention, is destabilised, with the framework of poles, an ostensibly trivial theatrical support, bearing as much significance as – or possibly even more than – that of the mountains themselves. 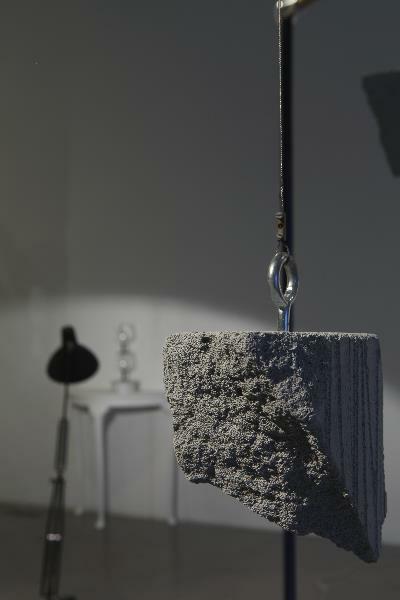 Ireland has also contributed a work comprised of steel mesh and concrete into which is inserted a piece of quartz crystal, a possibly magic fragment of nature caught in a trashy man-made screen or trap. 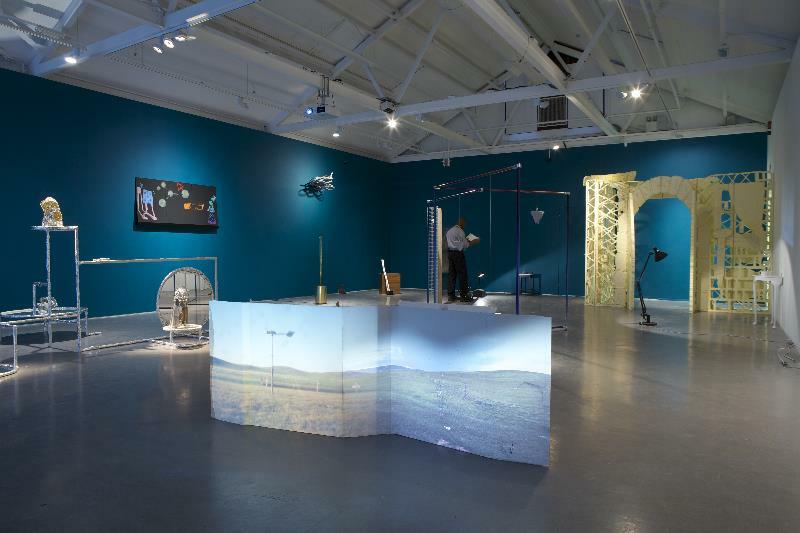 Ruth Claxton’s aptly titled Specular Spectacular, an installation piece in mixed materials, again operates as a viewing lens for the pieces adjacent to it, a frame within the frame that is the exhibition itself. 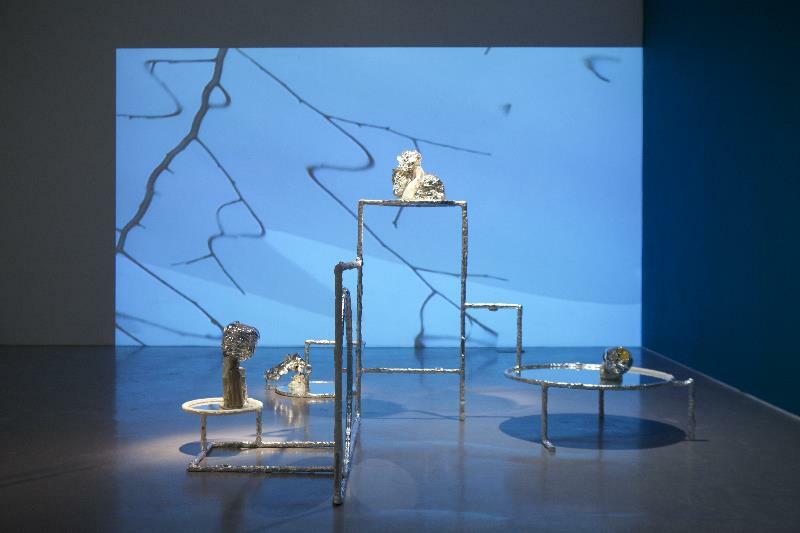 The work’s steel, mirrored, and transparent surfaces convey an illusion of interpenetration, mutation or contiguity as regards the entire display but it is, of course, a work in its own right, a carefully composed, highly flexible structure, perhaps analogous to an artificial organism into which other elements of the environment are drawn, but also “drawn around” and given space to breathe. The same artist’s Nest Piece again both a coherent work in its own right and yet generously open, suggests indeterminate extension and its opposite, namely the entropic potential of highly ordered natural or cultural configurations to spiral wildly out of control. Although Tom Woolner is the last artist to be referred to in the present text, his work is the first piece one encounters upon entering Glass Cat; in fact one finds one cannot but pass through this makeshift portal if one wants to see the show at all. A bleak but cleverly worked façade greets the visitor, who must walk through its cartoon-dumb doorway to gain admission to the display. The illustrational rendition of woodgrain on the door’s surface, etched with industrial adhesive upon a styrofoam structure, serves to remind us that we are entering into transformed territory. Upon leaving, the same doorway must also be employed. Where exactly, then, is the inside or the outside of this cogently delineated space? Is one entering an exhibition or leaving one behind? Where is the “real” to be found – inside the gallery or beyond it, within our mundane but highly-ordered borders or in another place entirely, somewhere utterly other? But only the Glass Cat knows the answer to this trenchant configuration of questions and conceits. The phrase employed in the title, “Transparent Things”, is from Vladimir Nabokov’s novel of that name (1972). 1. The “Glass Cat” is a character to be found in the Oz books of L Frank Baum (1856-1919). 2. The expression “Playful Physics” can be found in Duchamp’s The Bride Stripped Bare by Her Bachelors, Even, also known as The Green Box (1934). See, for example, Richard Hamilton’s typographic version of the Box, published under Duchamp’s name as The Bride Stripped Bare by Her Bachelor’s, Even (Hansjorg Mayer, 1976). The volume is unpaginated but the phrase can be found in the section headed “The illuminating gas”. Duchamp also makes reference in the Green Box to the casting of shadows, one of the leitmotifs of the present exhibition. 3. I am referring to the cats found in Joris-Karl Huysmans’ Down There (Sphere, 1974), in Charles Baudelaire’s several poems on the theme (included in his Les Fleurs du Mal, Harvester, 1982), and Edgar Allan Poe’s story The Black Cat, included in his Selected Writings (Penguin, 1980). For Carroll’s vanishing cat see Lewis Carroll/Martin Gardner, The Annotated Alice (Penguin, 1965, pp. 112 and following). 4. The “Voynich Manuscript” is the name attached to an as yet still undeciphered book-length manuscript discovered in 1912 by Wilfrid Voynich “in an ancient castle in Southern Europe”, according to Voynich himself, as quoted in Gerry Kennedy and Rob Churchill, The Voynich Manuscript (Orion, 2004, p. 9). For an account of the work and significance of John Dee, see Richard Deacon, John Dee (Frederick Muller, 1968), or the numerous discussions of Dee to be found in the writings of the Warburg scholar Frances Yates. 5. The literature on witchcraft is extensive but some of the most explicatory (as opposed to fanciful) accounts of their behaviour and reputation include Keith Thomas’ Religion and the Decline of Magic (Penguin, 1973), and Carlo Ginzburg’s Ecstasies: Deciphering the Witches’ Sabbath (Hutchinson Radius, 1990).